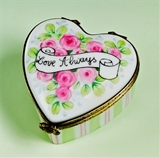 New Limoges Heart Boxes have arrived at The Cottage Shop! 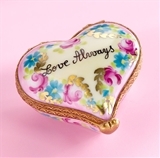 Our Limoges Heart Box Collection will delight you this year! 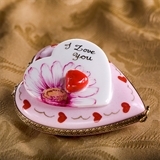 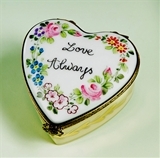 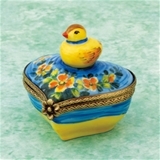 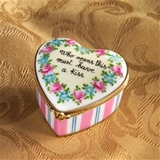 We have a large varietry of Limoges Heart Boxes to make sure we do not miss any of your romantic or friendly occasions. 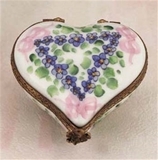 Please take a look at our Limoges museum heart with 3D flowers box, a real beauty , our Limoges with hand sculpted porcelain heart with a 3D rose box , the last ones in the series as they will no longer be made at Limoges due to a dissapearinhg artistry,our Limoges Heart with 3D bows, Flower Box. 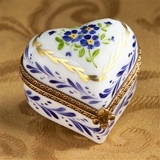 our exclusive Limoges Heart with a Four Leaf Clover and a Ladybug: the Limoges Good Luck Heart Box. 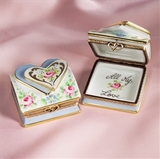 For traditional rich looking hearts, you will find our Limoges Gold Heart with Roses Box or our Limoges Gold Heart with a Mum Box. 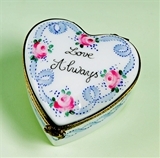 Alwayas in the French traditional Limoges box style , we can also offer you the Limoges Burgundy or Blue and Gold Heart with a Pink Rose, a cute little Limoges box with a lot of class. 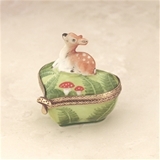 If you wish to give a child a Limoges Heart Box as a gift, please take a look at our Limoges Heart Boxes with animals: Limoges Baby Deer on Heart Box, Limoges Bunny on heart box, Limoges Ladybug on Heart Box, Limoges Dragonfly on Heart Box. 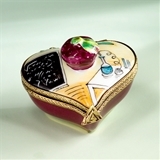 If your gift recipeint is a serious Limoges art collector or you would like to pamper yourself with a beautiful Limoges art objact, you may want to consider our Limoges Chamart Heart Boxes hand painted with magnificent detail. 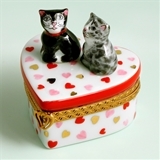 If you are interested in Limoges Christmas or Holiday Heart Boxes,please take a look at our Limoges Snowman on Heart Box, our Limoges Santa on Heart Box. 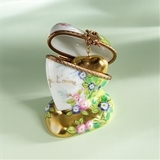 They always make great Limoges Gifts for the season. 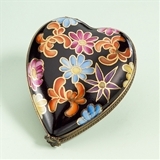 If the occasion calls for a more simpler or fresh looking Limoges heart box, please take a look at your Limoges hearts with flowers. 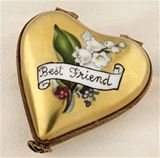 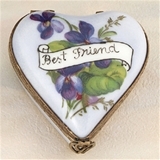 If you want to cherish a friend or your loved one, you do not want to miss our very well prices Limoges Best Friend Heart Box. 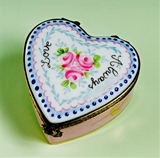 Limoges Happy Birthday Heart Box, or our Limoges Happy Anniversary Heart Box or Limoges " I Love Your Heart Box. 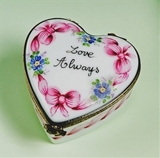 To impress your gift recipient with a perfect Limoges gift in Frencyh: the Limoges "Je t' Aime"- I Love you in French_ Heart Box. 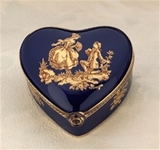 As we know Limoges Heart Boxes always make a great gift, please check our Limoges Specials Boxes Section where you will find Limoges Discounted Heart Boxes, just when very few are left in stock or to give you the chance to give a great Limoges gift at a super bargain Limoges Box Price. 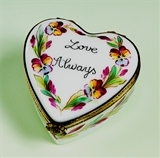 As usual all our Limoges boxes are Brand New and come directly from our Limoges commissioned artists decorators, a tradition at The Cottage Shop for almost 30 years.